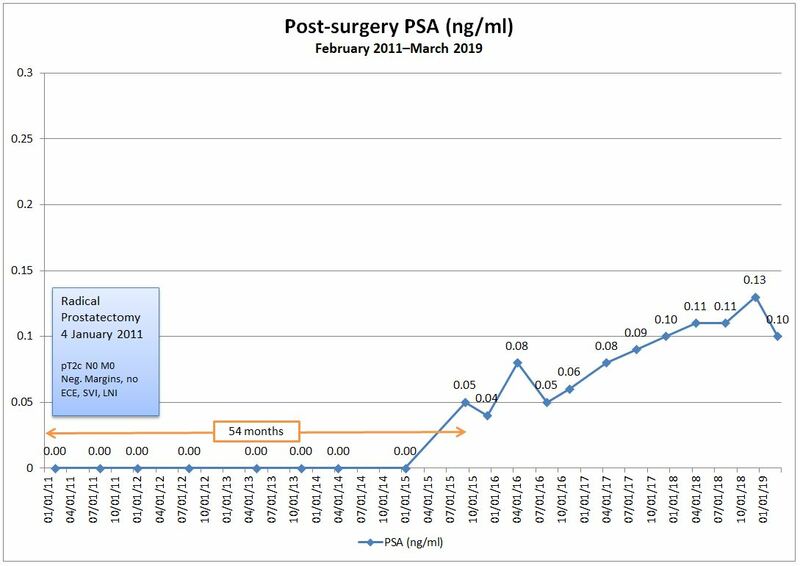 Here are status updates as to what life is like after my radical prostatectomy, addressing issues such as my latest PSA status, incontinence, and sexual function and their impact on my day-to-day life. I do updates every six months but, for some reason, I forgot to do an update at 12 and 72 months. Hi Dan. Valuable reading the various reports of your journey. Best wishes. Thanks. I learned from others who shared their experiences, so I’m glad that what I’ve been doing has been of value to others. Hello Dan, I so happy that I found your blog; it has been so helpful to what to possibly expect when I have my prostatectomy on February 28, 2017 at Hartford Hospital, Hartford CT.
B.T.W. and probably know this already; your blog stops at day 100 ?!?! Thank you again and continued success. Thanks for your comment and I’m glad that you found my blog. Good luck with your own surgery. I just checked and I can see all of my posts. What may have confused the issue is that I stopped doing daily posts after Day 98 and went to weekly posts for a few months. After that, I switched to monthly and as-needed posts. You can use the Archives drop down menu in the sidebar to access everything, too. I do poetry performance (thanks for the Like!) and didn’t know if/how to tackle the writing of my prostate experience. When I performed the piece you read, I was quite amazed at all the positive feedback (even more from the women than the men), do I’m glad that I chose to share the experience. I have other pieces that I haven’t put on WordPress, that also go down well. This blog of yours is excellent. It allows other misfortunates, such as I, to compare/contrast themselves and decide that they are not doing that badly after all. And we’re not, on the whole, doing half as badly as before. Those who haven’t yet been to get their symptoms checked are walking into a minefield with a blindfold on, so sharing stuff like this is vital in order to encourage stubborn blokes to do something before it’s too late. A lot of men of my age (68) have already died from various causes. Talking about it can only be beneficial. So thanks again. I’m not as consistent as you, so a bit useless at keeping up a diary but, as others have noted (above) this is invaluable. Do keep going! Good luck with your PSA.